Lysol 10 oz. 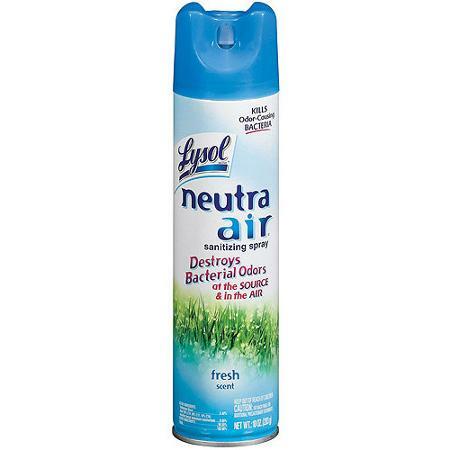 fresh scent aerosol spray for neutralizing odors. Contains patented odor-eliminating technology that provides a triple-action benefit. 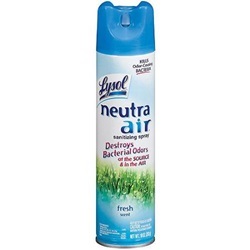 Neutralizes odors in the air from odor-causing bacteria; helps reduce airborne contaminants; refreshes the air by leaving a crisp, clean fragrance. Contains no CFCs. Manufactured by Lagasse. Comes in a case of 12 cans.